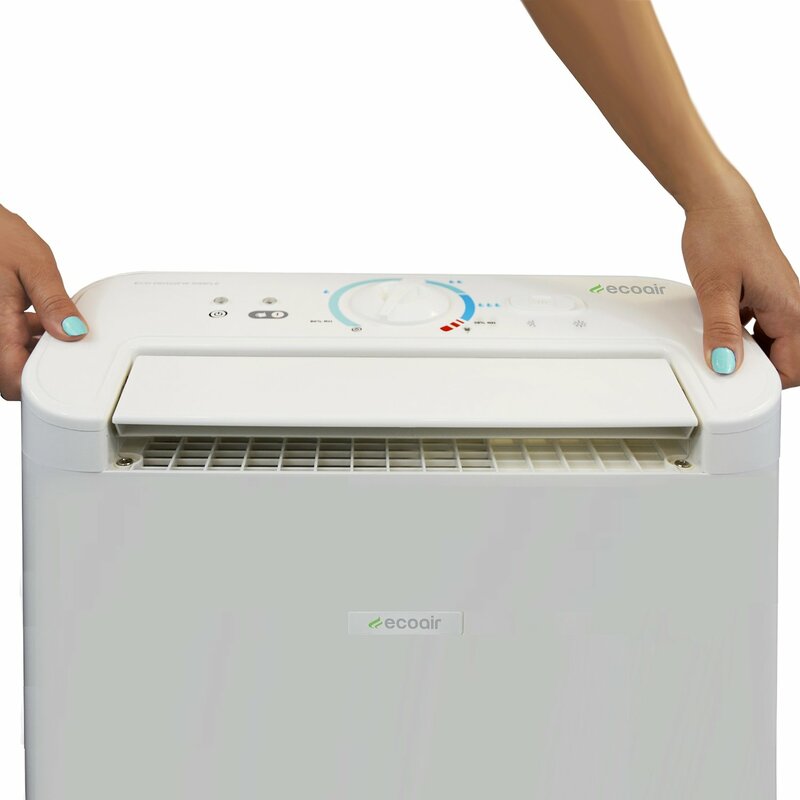 At ByeMould we are big fans of the EcoAir range of dehumidifiers and the EcoAir DD322FW Simple is certainly worthy of review. 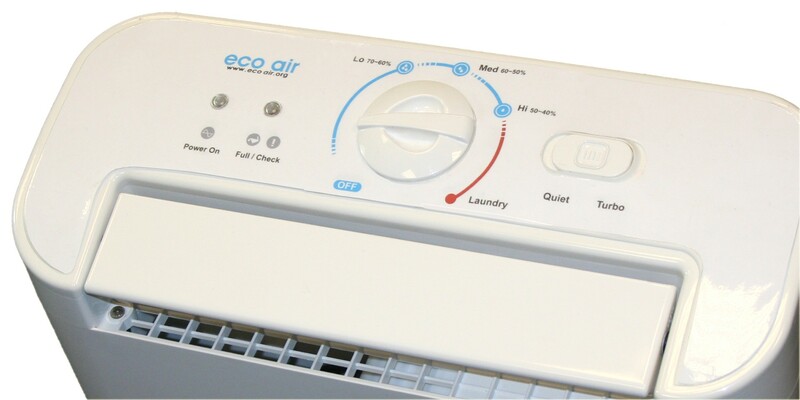 As the title says the EcoAir DD322FW Desiccant Simple is a desiccant dehumidifier which is the best type of dehumidifier to use in the UK/Ireland due to their efficiency, cheaper running costs than a compressor dehumidifier and quiet operation. Compressor dehumidifiers work better in warmer temperatures and water extraction can fail in temperatures less than 10°C. Desiccant dehumidifiers have an even extraction rate no matter what the temperature is (between 1°C and 35°C. So let’s start this review by looking at the pros, cons and features of the EcoAir DD322FW Simple dehumidifier. How Much Does The DD322 Simple Cost? The filter is a standard dust filter which is easily accessable at the rear of the machine. For those suffering from respiratory issues such as hay fever and asthma we would recommend an anti-bacterial filter such as those found in the EcoAir DD122MK5. THe DD322FW states that it removes up to 10 litres of moisture per day however you will find that this occured under test conditions of 20C and 60%RH. Extraction rates in the UK will be somewhat lower at around 6-7 litres per day. The tank is large for a desiccant dehumidifier and holds 3.5 litres of water. When the tank is full the dehumidifier will stop working and a LED light will warn the user to empty the tank. To do empty the tank simply pull the tank out from the lower rear of the dehumidifier and carry it to the nearest sink using the handle provided. You then remove the cover, empty the contents and place the cover back on. Quickly check that the little rubber plug is in the drain hole and if it is simply slide the tank back into the rear of the machine. The EcoAir DD322FW Simple also has a continuous drain function which allows you to keep the dehumidifier running while the collected water runs out of the tank and into a sink or other disposal unit automatically. This feature is very handy for caravans, mobile homes, sheds and garages etc and the DD322FW comes with a 1 metre hose for this purpose. A nice touch is that the DD322FW Simple features a water level viewer through which you can see the water level in the tank. The neat control panel is situated on top of the dehumidifier for easy access. From left to right you will see the ‘Power On’ indicator followed by the ‘Water Full’ indicator which lights up when the water tank is full or when the tank has been inserted into the dehumidifier incorrectly. Next you will see the humidistat (more on this below) which is followed by a ‘PowerSelection’ switch from which you can choose the ‘Normal’ or ‘Quick’ setting. The normal setting gives low heating power and low fan speed whilst the quick setting gives high heating power and a high fan speed. The control panel is simple and straight forward to use. The humidistat is simply a knob which you turn clockwise to turn the dehumidifier ‘On’ or anti-clockwise in order to turn the dehumidifier ‘Off’. The one water droplet economy setting sets the dehumidifier to 80-60% relative humidity (RH). The two water droplet medium setting brings the RH down to 60-45%. This is the setting that you will most commonly use. The three water droplet high setting gives RH of 45-35%. The humidistat can also be set between the water droplet indicators to get coser to the upper or lower RH ranges described above. The final setting is the ‘Laundry’ setting which works the dehumidifier at full power until the water tank is full. Like the EcoAir DD122 MK5 the DD322FW Simple features an 150 degree adjustable louvre. This feature is very handy as on normal power you could aim the louvre at stubborn damp patches or freshly painted walls in order to direct warm air into that direction for faster drying. The real beauty of the louvre is that you can point the louvre at clothes when drying them. Using ‘Laundry’ mode on the DD322FW results in the hottest air that the dehumidifier can muster. Adjusting the louvre so that this air flows over damp clothes results them in drying quicker. DD322FW weighs in at 9KG which is heavy for a desiccant dehumidifier however bear in mind that the capacity of the DD322FW is larger than most other desiccant dehumidifiers as well. With this weight one feature that is lacking are caster wheels on the bottom of the machine. The EcoAir DD322FW Simple works at temperatures between 1C-35C which makes it more efficient than compressor dehumidifiers in UK temperatures. Operating volume can be very quiet as the lowest setting produces only 36dBA. Tilt over stop protection is included. this means that if the dehumidifier is accidently tilted over while operating it will stop operations immediately thereby preventing any water/electrical emergencies. The dehumidifier measures 18.6 x 41.6 x 55.2cm. The DD322FW Simple comes with a standard 2 year warranty. The DD322FW Simple is a large, powerful machine with loads of good features. If it’s a large dehumidifier you want then you could consider purchasing the EcoAir DD322FW Simple. However if you are looking for a smaller dehumidifier then the EcoAir DD122 MK5 Desiccant Dehumidifier contains more features at a lower price. The DD322FW Simple is selling well and there are plenty of happy customers. I have also noticed that the DD322FW Simple rates very well on Amazon with a rating of 4.7 / 5 stars from over 130 reviews (at time of writing). Check out ByeMould s Ultimate EcoAir Dehumidifier Guide! Did you like reading this EcoAir Dehumidifier review? Let us know in the comments below.